Fundraiser by Tiffani 'Fenoglio' Martinson : Hope For The Cure! Hope is a sign off of 1-290. It’s easy to see in the dead of winter when branches are bare. And, it was on Valentine’s Day of 2018 on their very first ride to Northwestern Memorial Hospital when Eric and Tiffani saw Hope outside of their car window for the first time. Hours before, when Eric was diagnosed with Acute Myeloid Leukemia, something like hope wasn’t on anyone’s lips. Usually, it takes time to find such a word. It takes time to form any likeness of it. But sometimes, Hope appears in the most unlikely place; sometimes, you simply missed the Hope that had been there on so many journeys before. It found Eric and Tiffani quickly. On that long road to Northwestern, it was always there, just waiting to finally be seen. It first came as a sign, and then it came in faith, and then it came pouring in from the love of family, friends, old friends, neighbors, colleagues, and the staff who comforted Eric and Tiffani those first weeks in the hospital. Eric and Tiffani, time after time, say it is impossible for them to convey even their gratitude for the overflowing support they’ve been given over the past year. 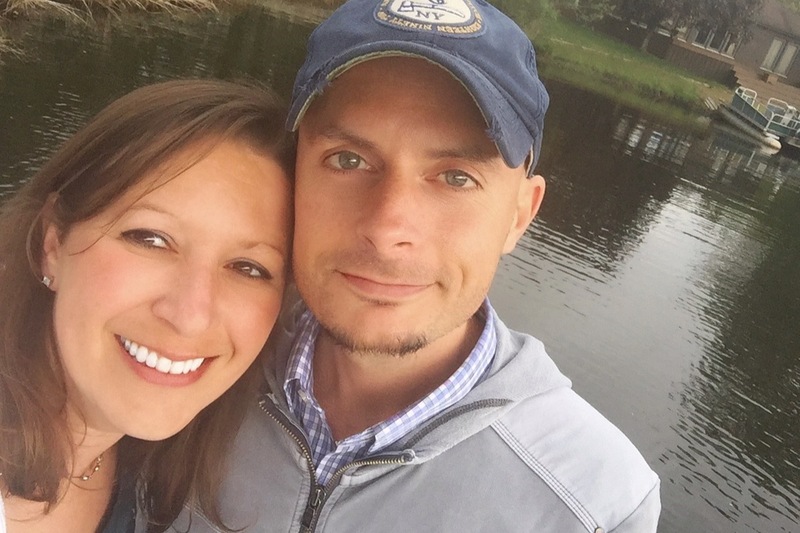 People’s prayers, gifts, cards, food, emotional support, visits, and even physical labor, all have given Eric and Tiffani the time and ability to fight this cancer together. While this journey has been arduous, they know how blessed they are to have the support system they do. In October, as many of you are aware, Eric’s AML relapsed. This news came at a time when Eric also finally exhausted his sick leave at work, leaving the two without an income. The day after Christmas, Eric began a clinical trial at Northwestern University to hopefully again achieve remission. The timing, unfortunately, means that even if successful, he will be unable to return to work for the spring semester at the College of DuPage. The anniversary of Eric’s diagnosis is a mere month away. While progress has been made, Eric and Tiffani still find themselves battling this awful disease. They find themselves in tight times with an uncertain future. But rest assured they have Hope. They have all of you. They feel blessed and have great faith knowing they are in God’s hands. All of you have already given so much already. Eric and Tiffani would not have had the time or means of fighting this cancer together had it not been for all of your support this past year. With Eric’s relapse and current work status, many of you have reached out asking how we can further support them. While it took some convincing, Eric and Tiffani have agreed for us to share this Go Fund Me site. It is with a deeply grieving heart that I share the news that Eric passed away Sunday morning. I can barely comprehend what has just happened and am aching to see my Eric again in Heaven. I miss him so very much. Eric’s wishes would have been for all of you to celebrate his homecoming to Heaven and the life he was able to share with us here. . He never understood why we all grieve so hard when we know the person who has passed is in paradise. I am unable to honor his wishes fully right now, but am working on it. While I hurt more than I thought possible over the life I shared with Eric that will no longer be, I do rejoice for him. Today we celebrate. Not in the way we had pictured or hoped, but a celebration nonetheless. One year ago today, life was irrevocably changed. Eric’s Leukemia diagnosis has been a battle we never expected, imagined or dreamt possible. Now we are planning for the next treatment. After 145 total days in the hospital (40% of this year), Eric will be admitted to the hospital again on Sunday 2.17 for another 2 week treatment of a clinical trial he was a part of back in early January. The result of that trial was not remission, but a stabilizing of the disease and previous trials have shown that a second round can be more effective. This is not the only option for remission, but his doctor believes it to be the very best option with the least amount of harm to Eric’s body. As we reflect on the past year there are, once again, so many emotions. A dichotomy of hope and fear, faith and doubt, victories and failures. So while today is not the celebration we were hoping for, we choose to celebrate the hope, faith and victories that we have had and those we have yet to achieve. As overused as these words have become, know that we mean them… Thank you all again! Once again, Eric is home! These are words we can’t get tired of :) He was able to come home Tuesday night after another 2 week stay in the hospital. It is believed that he had a reaction to the trail drug he received back in early January. Once that was figured out, he was treated with steroids and made a very quick recovery. He is still regaining his strength, but doing so with a happy heart. We absolutely love having him home! The next steps are being decided as results from the trial continue to be analyzed and watched. Please continue to pray that Eric’s body responds well and is fighting this evil disease! Also pray for the doctor’s wisdom as they look at the next steps that will get Eric closer to the cure. We cannot thank you all enough for sticking with us on this long and arduous journey. Your support through love, prayers and financial gifts has overwhelmed us and lifted us up! Blessings to you all and thank you again! Our time at home was much shorter than expected. After only 48 hours we were heading back to the hospital with a very high fever. Eric has multiple blood clots in his arms that are very painful and can cause fevers. They are also treating him for infection incase that is causing his high fevers. We weren't ready to be back and this has been another painful and trying week. The good news is that Eric's immune system is every so slightly starting to come back which should help resolve things.